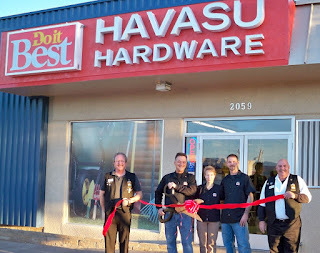 The Lake Havasu Area Chamber Ambassadors held a ribbon cutting ceremony for Havasu Hardware celebrating its 35 years in business and its new remodel. Attending the ribbon cutting from left to right were Steve Bentley, Scott LeGrand, Georgette LeGrand, Wayne LeGrand, and Lucky Atkinson. Havasu Hardware was founded in 1964 and purchased by the LeGrand family in 1979. They have been part of Do it Best since 1994 and are active in several community organizations including the Lake Havasu Rotary Club and the Sunrise Rotary Club. For more information please contact them at (928) 855-2120.